Bernadette Soubirous was a simple shepherd girl of fourteen, who hadn’t even made her first communion, when Our Lady appeared to her at the rock of Massabielle near Lourdes. 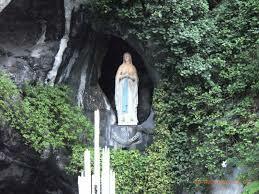 Lourdes grew to be the foremost Marian shrine in the world. Patrick Duffy tells the story. 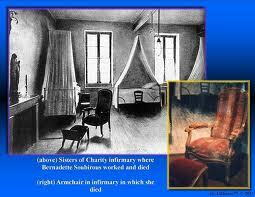 Born on 7 January 1844, and although christened Marie-Bernard, from childhood she was called Bernadette. she was the first child of poor parents living in difficult conditions, Francois and Louise Soubirous. Louise worked hard as a laundress and also worked in the fields when she could and was diligent in her Catholic observances. Francois was good-natured man, worked as a miller but was inclined to alcohol. After Bernadette, there was another girl, Toinette Marie, and three boys. As she grew, Bernadette cared for her younger siblings, and helped in their moral and religious training. She went to tend animals for a family friend at nearby Bartres but returned to Lourdes in January 1858, worried that she had not yet received her First Communion. Only then did she begin to attend the free school run by the Sisters of Charity and Christian Instruction. It was a cold day on 11th February 1858. Bernadette went with her nine-year old sister Toinette Marie, and a twelve-year-old neighbour’s child Marie Abadie to collect firewood. The two younger ones had taken off their shoes to wade across a stream and Bernadette got left behind. Suddenly she heard the noise of a sudden rush of wind and saw branches moving in the grotto. Above stood a beautiful young woman in a niche in the rock, dressed in a white robe, with a blue girdle and a white veil on her head. She had golden roses on her bare feet. She smiled silently and beckoned to Bernadette, who went down on her knees, took out her rosary from her pocket and began to say her beads. The Lady also had a rosary, but she allowed Bernadette to recite the decade and joined in only at the Gloria. When the rosary ended, the Lady disappeared. When the other girls came back, they saw Bernadette still kneeling and in a trance. They thought she was trying to escape gathering timber and began to chide her. At first Bernadette said nothing, but on the way home she could not hold her secret. She asked them not to tell her mother, but Toinette could not keep it back and soon the story spread. Bernadette wanted to go back next day, but her mother said no. On the following Sunday when she asked if she might go to the grotto again, her father told her to take a bottle of holy water with her. She went with several little friends and knelt at the grotto. She saw the vision again, but the others saw nothing. News spread in the town. Her teacher and the mother superior at the convent forbade her to talk or even think about it. The following Thursday, 18th February, Bernadette went with two women who thought the lady might be the spirit of a young friend of theirs who had died a few months previously. This time the Lady smiled to Bernadette and spoke. She asked her to come every day for fifteen days. Bernadette promised she would, if she was allowed. Bernadette’s parents did not object. The following day her mother and aunt went with her, and on later visits great crowds of people gathered at Massabielle, hoping to see or hear something miraculous. The excitement increased. Bernadette was brought to the police-station for questioning but she didn’t change her story. The following Sunday, a number of people gathered with Bernadette. This time the Lady told her: “You will pray to God for sinners”. On 26th February, while she was caught up in the vision, Our Lady told Bernadette to dig with her hands on the ground inside the grotto, to drink the water and wash her face. Bernadette did as she was told. A trickle of water appeared and when the lady told her, she drank it and bathed her face. Next day a steady stream was flowing from where there never had been a well or a river before. It has remained to this day and is the source of the water of all the baths at Lourdes. Those present regarded this as a miracle. When Bernadette reported this reply, it caused a fever of excitement. Four years previously Pope Pius IX had solemnly proclaimed in Rome that Our Lady was preserved free from all stain of original sin, called the dogma of the Immaculate Conception . Bernadette could not easily have known or heard such words as at that time it was something that would only have been discussed by priests. After that there were only two other visions – on 7th April and 16th July. Many times afterwards, Bernadette was often asked to repeat the story of the visions, but the accounts never varied in any significant detail. By now the local people, after seeing the miraculous new stream, frequently gathered at the place wanting to turn it into a sanctuary. The local authorities closed off the area. 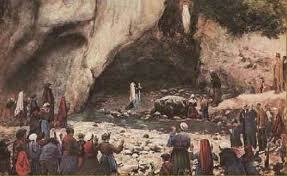 But news of the apparitions and miracles spread and soon the Church authorities were won over to believing Bernadette. It is said that the Empress Eugenie heard what was happening and may have influenced her husband Napoleon III to intervene. At any rate on 5th October the grotto was reopened. The following year thousands of pilgrims were thronging to Lourdes. A statue of Our Lady was erected at the grotto in 1864; Fr Peyremale had now become Bernadette’s advocate with the bishop of Pau and helped raise money for a basilica that was built nearby and consecrated in 1876. A second church at the base of the basilica was erected and consecrated in 1901. Landscaping and architecture turned the whole area into an impressive sanctuary against a background of great natural beauty. Meanwhile Bernadette was staying at the local convent of the Sisters of Charity and Christian Instruction (Notre Dame) and endured the intrusions on her privacy as patiently as she could. At twenty she decided to join the order and soon went to Nevers, the motherhouse in central France to do her novitiate. Her novice-mistress here had been her teacher at Lourdes and was determined not to allow Bernadette become proud because of her visions. Bernadette applied herself seriously and learned to perform her tasks with humility. Her sympathetic nature made her popular with sick people, and she was appointed assistant infirmarian. Suffering from chronic asthma herself, she asked for water from the Lourdes spring during a severe attack. Her symptoms subsided permanently. Visitors and celebrities came to the convent and she did not want to be locked away. She had a cunning and good humoured way of dealing with intrusions. One day a visitor stopped her as she was passing along a corridor and asked where she could get a glimpse of Sister Bernadette. The little nun said, “Just watch that doorway and soon you will see her going through.” She then walked on and slipped through the door. Again she became ill – this time a tumour on her knee, which became so painful she was given a different job – in the sacristy. Here she showed skills in needlework and a talent for the embroidery of vestments. After she made her final vows in 1878, her energy became so low she was confined to a wheelchair and often to bed, but she continued her needlework. 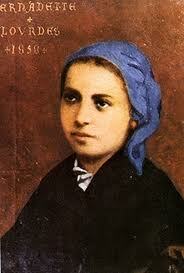 Bernadette died on 16th April 1879. 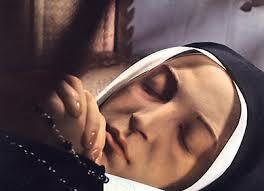 Her body was put in a casket, which was sealed and then buried near the chapel of St. Joseph in the convent grounds. It was exhumed in 1908 by a commission to examine Bernadette’s life and character and was found to be intact and uncorrupted. Since then it reposes in a glass reliquary in the convent chapel. She was beatified in June 1925 and was canonised by Pope Pius XI on the Feast of the Immaculate Conception, 8th December 1933.